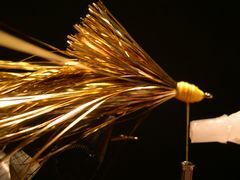 The Gold Flashabou Streamer is my version of a streamer first made by Ed Story of Feather-Craft Fly Fishing. 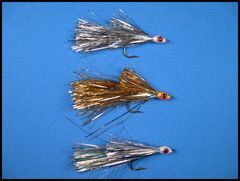 The Flashabou Streamer is fashioned after an Ed Story pattern, made with Salt and Pepper Flashabou, called the F-C Salt Shaker. Ed designed the F-C Salt Shaker to take Spanish Mackrel. Since that time more than 29 species of fish have been caught on it. I ordered the F-C Salt Shaker pattern sheet from Feather-Craft and modified the recipe by substituting Gold Flashabou and red plastic eyes. 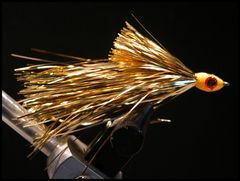 The result is the Flashabou Streamer which I now tie in Gold, Silver, and Salt and Pepper. 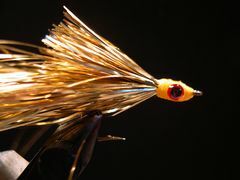 The fly is easy to tie. 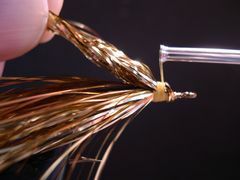 The amount of flashabou that is needed may be hard to judge at first but you will quickly get the hang of it after tying a fly or two. My recipe calls for a Mustad 3366 hook in size 4 because I wanted to take Bass, slab-sized Bluegills, and Crappie with it. Ed's Salt Shaker pattern specified a similar salt water hook ( Mustad 34007) in sizes 1, 2, and 4. I recommend using Danville Flat Waxed Nylon so you can quickly build a fairly bulky head on which to install the eyes. You can coat the head with 5-minute Epoxy but I believe that Loon Hard Head fly fihish works better and it's a heck of a lot easier to use. 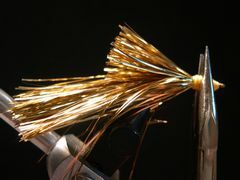 The first time I fished a Gold Flashabou Streamer was a hot sunny day with temperatures in the mid-eighties and the sun high in the sky. Fishing was really slow. I decided to tie on the golden streamer and fish it over some submerged weedbeds hoping to bring the fish up out of the cover.The weeds were about a foot and a half below the surface and the water was gin clear. I cast the fly over weeds and let it sink about a foot or so. Just deep enough to skim the weed tops without hanging up. 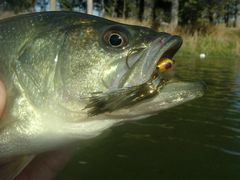 In the next hour, fishing the Flashabou Streamer, I moved 8 bass ranging in size from 10 to 16 inches. In one instance a fish moved a good ten feet to take the fly. 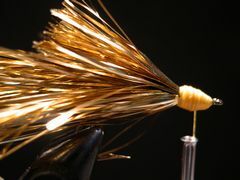 Cast the fly, let it sink to the desired depth, and fish it like you would any other steamer in still water. Clamp a hook in the vice and crimp the barb. 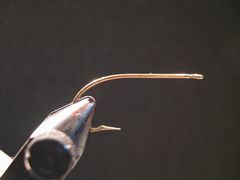 Attach the thread and lay down a thread base from the hook's eye to the hook's bend and back to the eye. 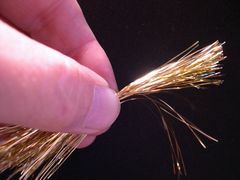 Tie in one strand of Gold Flashabou at the front of the hook and wrap it back to the bend covering the thread base with it. 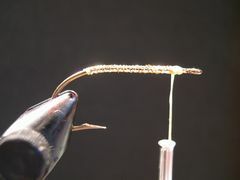 Return the Flashabou strand back to the front of the hook with wide wraps and tie it off. Remove a bunch of marabou strands - about 30 or so - and fold them. Then seperate them so that you end up with two bunches about three inches in length. Put the two bunches together to form one bunch. 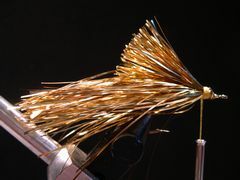 With the thread hanging slighly behind the hook's eye tie in the bunch of flashabou so that it extends an 1 1/4 inches or so beyond the hook's bend to form the wing. The remaining portion of the flashabou should be proturding out in front of the hook's eye. Now fold over the flashabou that's protruding in front of the hook's eye back over the standing thread and bind it down to form the streamers collar. Don't let go of those flashabou strands until you trim them. Trim those strands with your scissors so that you end up with a collar that extends ever so slightly beyond the hook's bend. 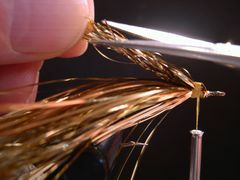 This is the way your Flashabou Streamer should look as you prepare to build the thread head in the next step. 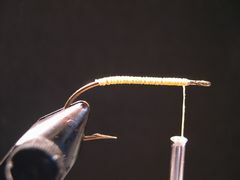 Build a substantial thread head that's large enough to accept the 1/8" plastic eyes. Once you're satisfied with the size of the head tie of the thread with a Zap-A-Gap knot. Coat an inch or so of the thread nearest the hook with the cement and wrap the wet thread over the existing thread wraps. It will dry almost instantly. Clip the thead and your knot is complete. 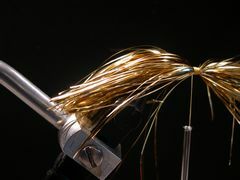 Gently flatten the thread head with smooth-jaw pliers. Stick the adhesive backed eyes to the head. Paint the head with a couple coats of Loon Hard Head fly finish and let dry overnight. Your Gold Flashabou Streamer is finished.